Dough and batter are two commonly used words in kitchens and restaurants. They are two stages in baking process and are used for making various recipes. Dough is a comparatively a solid mixture than batter which is more liquid in nature. Dough is made by mixing water with flour and kneading it into the shape of round balls or into any other shape of the maker’s choice. The whole process is done with hands. In making dough, flour made from rice, rye, almonds and other cereal crops is also used. The type of product, cooking and baking techniques, nature of the products also determines the form of dough, particularly its viscosity and elasticity. Fermented dough is used to make breads. Some types of bread dough also contain milk or egg. Sometimes dough conditioners are also used before making the final products. Among dough products, notables are flatbreads such as Pita, Lavash, Naan, Sangak, Yufka and Crackers are also made from dough. Pasta and noodles are also made with unfermented dough. Various techniques are used in producing different products. For yeast-based breads, dough is mixed, kneaded and left to rise. Temperature and time are of great importance for this process as they affect the final product. 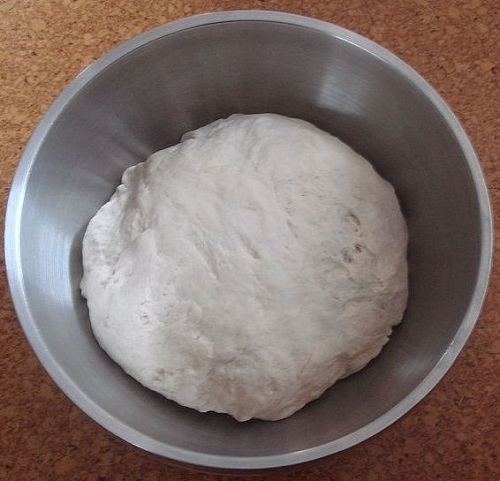 Dough for biscuits and flatbreads is shaped and cooked directly after mixing. In making some types of dough-based food, such as tortillas, heat is directly applied. Batter has so many things in common with dough that many mistake it as dough. Batter can be made with a blender. Batter is made with water, flour, egg and milk – a perfect combination for making cakes. Batter is also used as a coating for fried foods and a number of recipes such as cookies and omlettes can be made with it. If you go by the rules followed by bakers, the more flour is added to the mixture, keeping the quantity of water constant, the more solid form it will take. If the ratio of water and flour (and other ingredients) exceeds 1:2, the mixture turns harder and changes its category from batter to dough. To fluff up the batter, baking powder is added. In making some particular recipes, carbonated water or beer is used to aerate the batter. To make the batter a little more solid, it is fried or steamed. By adding sugar or salt, batter may be made sweet or savory respectively. Some users include herbs fruits or vegetables to add different flavors to the recipes. Apart from the purpose aerating the batter, beer is used to add color and flavor to the foods such as fish and chips. Beer battering is a very popular practice in the USA, Australia, New Zealand, Ireland and Britain. Pinaki Chakraborty. "Difference Between Dough And Batter." DifferenceBetween.net. November 20, 2015 < http://www.differencebetween.net/object/comparisons-of-food-items/difference-between-dough-and-batter/ >.